How long do YOU spend replying to e-mail each day? The average American worker now spends two hours responding to business e-mail every single day. And on average, we each spend a further thirty minutes responding to personal messages. Are YOU overwhelmed by your Inbox? Would YOU like to clear ALL of your e-mail messages – in JUST MINUTES? Voicemail Recorder™ is the ULTIMATE solution. Voicemail Recorder allows you to create your own voice e-mail messages – guaranteed to impress friends and colleagues – in just SECONDS. It requires NO extra software, NO special configuration and works with ANY e-mail client. Your voice message is then sent as a tiny, compressed MP3 attachment. It’s EASY, it’s PERSONAL, it’s CREATIVE – and it’s QUICK. 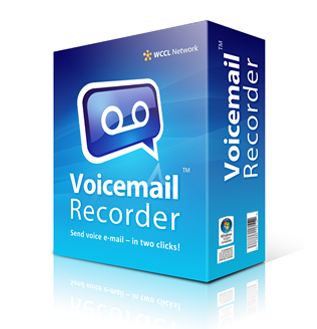 With Voicemail Recorder, you can clear your entire Inbox in just minutes. It makes replying to e-mail fun again – and you’ll be amazed at how it affects your productivity. Voicemail Recorder™. The solution to e-mail overload. Available as instant download. Requires Microsoft Windows. Send Voice E-mail in Two Clicks! messages into short voice messages! Be More Personal, Impress Friends! Make people smile when they receive your voice message. It’s a more creative way of communicating! whether they use a PC, Mac, PDA, or mobile phone! membership website. There’s nothing special you need to setup! Your messages are sent as high-quality, yet tiny attachments. For example, a 30-second message is just 32kb! help videos, full lifetime support – and more! Grab your copy of Voicemail Recorder today – and you could be enjoying ALL of these features within the next five minutes! Want to get started with Voicemail Recorder – 100% RISK-FREE? We know that Voicemail Recorder will change the way you use e-mail forever. That’s why we’re confident enough to offer you a 14-day no-quibble refund guarantee! Simply let us know and we’ll refund EVERY PENNY you paid! PLUS: Purchase before midnight, Monday, January 28th 2019 - and you’ll receive FREE lifetime support and FREE lifetime upgrades. So, get started with Voicemail Recorder TODAY! Want to view the online demo and screenshots? Click here. Home - Video - Affiliates - Contact Us - BUY NOW!